Perhaps no other fitness program has the ability to make movements popular like CrossFit. The toes to bar exercise is a prime example of a movement regularly included in CrossFit workouts that has become wildly popular in the fitness world. Why do they program it? CrossFit places a premium on developing athletes that are strong and capable of moving their body in many different ways. The toes to bar is a compound movement that tests your core strength, shoulder strength/mobility, grip, and in many cases, your kipping ability. Safe to say it fits the bill. There’s a reason the toes to bar is 1 of 7 movements that has come up in every CrossFit Open competition. 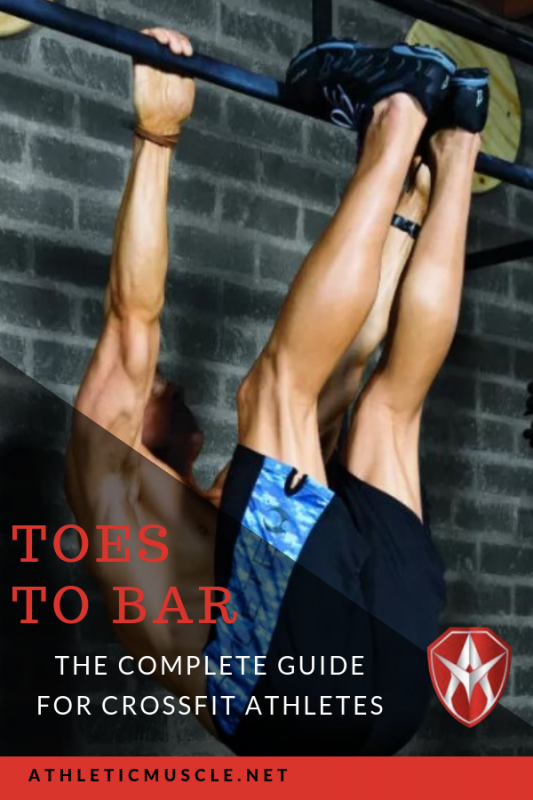 If you don’t know how to do toes to bar, or they have proven to be the bane of your existence in CrossFit workouts, this guide is for you. This guide also includes 3 CrossFit workouts containing toes to bar that test different types of fitness. If you’re looking at these cues and think it’s a lot to remember, you’re right. A good coach will simplify the movement as much as possible. Count a rep each time your toes make contact with the bar you’re on. Bring your legs back down past the base holding up the bar you’re on before going up again. Keep tension in your core and shoulders throughout the whole exercise. This is a simple approach, but it at least gives you an idea of what a good toe to bar rep looks like. Remember that toes to bar are 1 of 7 exercises that have come up in every CrossFit Open since 2011. If you have any aspirations of being competitive in CrossFit, toes to bar are one of the movements you must master. If you’re performing toes to bar in a CrossFit WOD, you are likely using the kipping variation. The next section will walk you through how to practice and progress the movement. Here is everything you need to know about mastering the kipping toes to bar, including progressions, tips to be efficient, and modifications for getting your first one. The absolute foundation of kipping correctly is initiating the movement from your shoulder and activating your lats. Whether you’re doing toes to bar, pull-ups, or just practicing the kip, your kip is incorrect if you are swinging your legs to create your momentum. Levers. Begin your kip. Forcefully activate your lats in the “hollow” position (legs in front). This should position your body behind the bar and bring your eyes closer to the bar. “Knees up. Keep the lever going. Lift knees up in hollow position. “Knees to chest”. Keep the lever going. Lift knees up in hollow position, bringing them up to the chest. “Toes To Bar”- In the last step, lift your knees to your chest in the hollow position, then “flick” the bar with your toes. Efficiency Tip: Do your toes to bar like you’d do a knees to elbow. Watch the video below. You will die out faster during your set of toes to bar when you “pike”. This position forces you to use more energy and requires you to kick harder to reach the bar. See the image below for an example of a pike. Forcefully contract your shoulders in the hollow position. Activate your lats to move your body behind the bar. This shortens the distance your feet have to travel to the bar. Stay in line with the rack when your feet come down from the bar . This means your core is engaged throughout the movement and you aren’t “resetting” at the bottom. Doing so will cause you to lose your kipping rhythm. This modification is good for athletes that understand the kip but can’t string together toes to bar reps yet. The knees to elbow can be performed with the same progressions as the toes to bar: practice levers first, add the knees, then set the standard of bringing your knees to your elbows each rep. The same is true about the toes to bar as well. Get your body behind the pull-up bar to shorten the distance your knees have to travel. To start: perform a set of 10 every minute on the minute for 7 minutes. If you can’t get 10 towards the end, write that down and get more total reps next time. You can practice hanging knee tucks the same way as knees to elbows or toes to bar, just shortening the distance. This is a good way to work up to knees to elbows and eventually kipping toes to bar. To start: on a :30 clock, perform as many good hanging knee tucks as you can. Only count reps if your kipping rhythm is correct (no swinging and aimlessly crunching). Reset on the bar each time you lose the rhythm. Let’s say the goal isn’t to perform toes to bar in a CrossFit workout. In that case, you may want to learn how to perform a strict toes to bar instead. Here are some tips, progressions, and movements you can modify with if you aren’t quite there yet with your strict toes to bar. Watch this video to see the difference between strict and kipping toes to bar. With pointed toes and flexed shoulders, bring your toes to the bar. Maintain control and speed throughout the movement, including coming down from the bar. Tip: start slow and progress. Unlike the kipping variation, you will be very much limited by how strong your core is when doing strict toes to bar. Begin with a few good reps and modify to leg raises when you start off. Add a few reps over time and build the endurance. Being proficient at strict toes to bar will keep you on the bar longer during sets of kipping toes to bar, too. This is a very basic modification that most athletes will be able to do. Cue all of the same things (especially tension in the shoulders and pointed toes). Control the movement start to finish. To make it more difficult, don’t let your heels touch the floor in between reps.
To start: perform 3 sets of 10 with :60 rest between sets at the end of a workout. Breaking at the knee, the rep will conclude once your knee gets about as high as your belly button. Control the movement on the way up and down. Toes to bar are a compound gymnastics movement that taxes your grip, shoulders, and core muscles. Anything barbell movement requiring grip (snatches, cleans, deadlifts) will pair well, but shouldn’t be too heavy. It’s probably a good idea to space out (or omit) movements from the toes to bar where you must grip a bar or rings (pull-ups, muscle ups). Toes to bar go well with any cardio movement as a couplet or triplet. Your grip and core will have time to recover while you run/row/bike. 16.2 is a 4 minute survival workout, where you must complete the reps inside 4 minutes to advance to the next 4 minutes of the workout. The movements are 25 toes to bar, 50 double unders, and a progressively increasing squat clean ladder (starting at 135 and ending at 315). There are few movements in CrossFit that require the coordination, upper body strength, core strength flexibility and rhythm that toes to bar do. It is likely one of the reasons they are a staple of competitive CrossFit competitions, and have become very popular across the fitness industry. When learning the kipping toes to bar, make sure your kip is correct. Initiate the movement from your shoulders and get your body behind the bar. This will shorten the length your toes have to travel to the bar on each rep. While the strict toes to bar requires that you have a strong core, there are many ways to modify the movement. Start on the floor if you have to and work your way up. Building endurance with the strict variation will translate to more kipping toes to bar during your CrossFit workouts. The toes to bar can fit into almost any CrossFit workout, as long as you aren’t taxing your grip with all the other movements in the WOD. However you train, and whatever you’re training for, the toes to bar will help you develop a stronger core, better grip, and give you a good opportunity to master your kip (so those muscle-ups become that much easier). Use these videos and cues, and apply the progressions to your current skill level. With practice, you can master the toes to bar, one of the most important movements in CrossFit.